322 pages | 35 B/W Illus. A seminal shift has taken place in the world of investing. A clear and overarching reality has emerged which must be solved: financial considerations must factor in sustainability considerations for ongoing societal success, while sustainability issues equally need to be driven by a business case. As a result, investment practices are evolving, especially towards more positive philosophies and frameworks. Sustainable Investing brings the reader up to speed on trends playing out in each region and asset class, drawing on contributions from leading practitioners across the globe. Implications abound for financial professionals and other interested investors, as well as corporations seeking to understand future investment trends that will affect their shareholders’ thinking. Policymakers and other stakeholders also need to be aware of what is happening in order to understand how they can be most effective at helping implement and enable the changes arguably now required for economic and financial success. Sustainable Investing represents an essential overview of sustainable investment practices that will be a valuable resource for students and scholars of sustainable banking and finance, as well as professionals and policymakers with an interest in this fast-moving field. 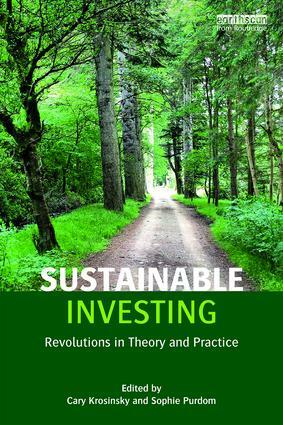 Cary Krosinsky is a noted educator and author on the nexus of sustainability strategy, investing and financial value. He teaches at Yale University, USA; Concordia University, Canada; the University of Maryland, USA; and Brown University, USA; and acts as Senior Advisor to organizations such as the Carbon Tracker Initiative, the Principles for Responsible Investment and Wilshire Associates. Sophie Purdom is a Henry David Thoreau Scholar, the co-creator and instructor of the Theory and Practice of Sustainable Investing course at Brown University, USA, and established the Brown Sustainable Investment Fund. She is currently an Associate Consultant at Bain & Company in Boston and will be attending Harvard Business School, USA.